Heavily armed gunmen took control of one of Islam's holiest shrines in Mecca, Saudi Arabia with a self-proclaimed "Mahdi" in command of the group. In Sunni Islam, the Mahdi is a messiah-like figure destined to return religion and justice to the people. The government immediately tried to downplay the attackers, calling them "just a small group of fanatics." However, this small group was well organized and coordinated. Weapons and food had been stored away in advance of the attack. They were obviously familiar with the underground tunnel network beneath the shrine and laid explosives effectively. Finally, they swiftly rebuffed a wave of Saudi troops sent to retake the shrine, who consequently suffered considerable casualties. Stories quickly spread that this was part of a planned coup d'etat. This idea was reinforced when it was rumored that the head of the royal family had been expected to be there at the time of the attack. Eyewitnesses reported that insurgents moved about the crowd looking at faces. Sounds like something for cable news tonight? In fact, this event actually occurred on November 20, 1979. The Saudi government was ultimately able to put down that rebellion with overwhelming force, and, not unexpectedly, no prisoners were taken, the answers to many riddles dying along with them. Soon things were back to normal and pilgrims began visiting again. In fact, there seemed to be no trace of the events, which is exactly what the House of Saud prefers. Yet there were still unsettling facts. It's hard for a Westerner to imagine the brashness of an attack on such a shrine, or its sheer blasphemy in the eyes of the believer. As mentioned, the complex organization and planning of the attack makes it difficult to believe that there wasn't further involvement. There were certain quiet dismissals shortly afterward within the Saudi Armed Forces that could suggest suspicions of involvement or complicity. One can only speculate about motives. Meanwhile, the U.S. foreign policy establishment was still reeling from the unexpected overthrow of the shah of Iran by the Ayatollah Ruhollah Khomeini and his Shi'ite followers that same year. What made the Iranian Revolution as well as the attack at Mecca all the more unsettling, of course, was that none of the major Western intelligence services had any idea they were about to happen. The inevitable questions arose. Were these events related? Was this a sign of an approaching wave of instability spilling over from Iran into the region? Or perhaps worse, could the attack on Mecca be a sign of internal unrest—an initial crack in the very fabric of Saudi society that up until then seemed so neatly packaged. But that was 1979. Al Qaeda and 9/11 were many years away. So as time went on, things began to recede and there was a return to the comfort zone. Mideast analysts soon began to downplay the attack and emphasize Saudi Arabia as solid partner. It was noted that the more activist Shi'ite sect in Iran was quite different from Saudi Arabia's Sunni Islam. It was viewed more as an "establishment" religion prone to influence from the existing state authority, and certainly Saudi leaders had been very skillful at capitalizing on this. It's also important to note that the Pahlavi ruling class of Iran lasted but two generations, while the Saudi leadership had their roots in the desert for two centuries. Finally, while the shah made no secret of his utter contempt for the ulema, the religious learned class in Iran, Saudi Arabia embraced theirs. Over the years it expanded its influence within the religious community through intermarriage, and by bestowing financial gifts and incentives to the clerics. They are able to co-opt the powerful mullahs by offering them prominent, prestigious positions of influence. For example, the Majlis al Shura was established as a consultative religious body to the king. While the above rationales may soothe much of the political class, the Mecca incident still served as an early red flag, and there have been more sporadic upheavals since them, which should cause us to take a second look. More importantly, the factors that create instability in the Kingdom are even more in force today. The United States' expanded presence in the region is seen as directly hostile to Islam, and Saudi Arabia's close ties with the United States have been costly. Osama bin Laden, a Saudi, did not attack the United States because of its support for Israel, but rather he became angered and motivated when U.S. troops were stationed on Saudi Arabian soil during the first Gulf War. Fifteen of bin Laden's 19 hijackers on 9/11 were Saudi citizens. A recent poll by the University of Maryland that was funded by the Department of Homeland Security measured local views in several Muslim countries and consistently found that over 70 percent believed that the U.S. efforts in the Middle East were directed at weakening and dividing Islam. Whatever one thinks about the wisdom of President Obama's significant increase in troops in Afghanistan, for example, it's logical to conclude that our continued and expanded presence in the region can't help but provide fertile ground for like-minded radicals inside and outside of Saudi Arabia. 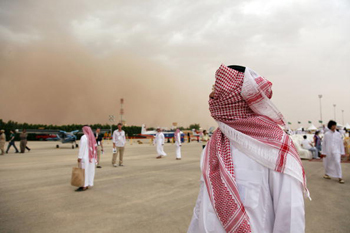 Saudi Arabia maintains a considerable population of foreign workers. The radicalizing or political-consciousness-raising effect of foreign groups (particularly the Palestinians) in an orthodox, conservative setting such as Saudi Arabia is not lost on the royal family. The fomenting of revolt among the resented and exploited class workers is a real threat, but the occasional expulsions of "troublesome" groups seem more like random efforts to plug a dike. According to the BBC, there are more than 5 million expatriate workers in a country with a population of 24 million. Among them there are currently 40,000 to 45,000 U.S. citizens and 30,000 British nationals in Saudi Arabia. The inherent social tensions cannot be ignored. An example of this came on June 25, 1996, when terrorists from Hezbollah al-Hejaz bombed and devastated the Khobar Towers, which housed foreign military personnel, killing 19 service men and wounding 372 members of many nationalities. Since then, countless kidnappings and executions of Westerners have been carried out by extremists, which serve as a sober reminder of our vulnerability there. The shock of oil in Saudi Arabia has been at once a blessing and a curse. It has forced the ruling class to balance the breakneck speed of subsequent modernization with the Islamic values of a country where not long ago mostly Bedouins roamed the desert. The Saudi leadership has made efforts to placate its populace. A Saudi citizen enjoys advantages inherent in an oil-rich country, including free education and healthcare among many other benefits. Sabria Jawhar notes that a Saudi living below the poverty level and suffering from terminal cancer will receive around-the-clock care no matter what stage of the illness. If the patient lives in Jeddah but needs treatment in Riyadh, not only is there a bed available to him, but he is entitled free transportation via aircraft to Riyadh and is permitted to have a relative accompany him. However, even with such generosity, the growing chasm between the very rich (and the non-Islamic excesses that go with it) and the lower classes is certainly not lost on the people. Finally, in an effort to accommodate their Sunni fundamentalist movement, Wahhabism, and its leadership, the Saudi's have subsidized the related madrasas, or Islamic religious schools. But these have become a hotbed of extremism, with some of their alumni involved in the 9/11 attacks. Such schools could also pose a danger to Saudi Arabia itself by creating future radicals that could turn on the government for any reason mentioned above. These are just some examples of social conflict and contradiction within the society that, taken individually, may not pose a threat. But combined with the other factors, any one of them could potentially become a powder keg. Saudi Arabia is a country that is critical to us and has drawn much attention, but still many of its cultural and political aspects appear to fall below the radar. Maybe this reflects our wishful thinking about its resilience as a society coupled with our increasingly dependent relationship. Another reason for the lack of focus is that other serious "hot spots" in the Middle East all but dominate the regional and international discussions. Further, the Kingdom's innate secrecy and its efforts to promote an image of stability are bolstered by a United States that has a considerable interest in maintaining the status quo. We should ask, however, if such factors continue to lull us into a bit of a nap, much like Iran did along with its enablers just before the fall of the shah. In other words, is Saudi Arabia headed down that same path as Iran? In the current environment of the region, we would be wise not to ignore such a possible outcome. Chris Tyree studied at the Eastern European Institutue in Fribourg Switzerland as well as at the American University School of International Service in Washington. He lives in San Diego and writes on international affairs, particularly the Middle East.